BARN Lawn & Landscape. 70 years family owned and operated. In 1945 Ben Asjes and his wife Virginia purchased a piece of land in Raytown, Missouri. For two years Ben cleared the land, built a house for his wife and kids, and constructed all of the buildings needed to run his business. Notice the phone number on the truck FL3-1203, the same number still used today. In 1947 "Raytown Landscape Nursery" opened it's doors for business. As the city of Raytown grew, so did Raytown Landscape Nursery. The nursery was a complete tree and ornamental growing operation with many greenhouses, potting sheds, a complete retail garden center, and all of the shops and garages to house and maintain the farming equipment. The license plate on Ben's truck was customized to say "BARN", for Ben Asjes Raytown Nursery. In 1967, Bens daughter Cheryl, married her high school sweetheart Gary Caton. After Gary completed his military tour of duty in SouthEast Asia during the Vietnam War, he and Cheryl returned home and Gary began working for his father-in-law at the nursery. Over the years, Gary helped to expand the company into the landscape design and construction, and lawn care and maintenance markets. Of course Cheryl has spent all of her life working at the nursery, so it is no surprise that her and Gary's two children also grew up working and playing there as well. Ben's mother could often be found working around the nursery. 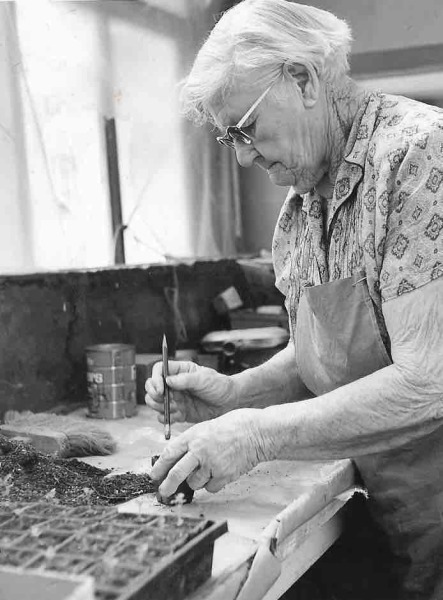 This picture of her was taken in the early spring of 1970, planting seedlings for the upcoming season. In 1989, Gary and Cheryl's daughter Stephanie, married her high school sweetheart, Nick Brown. After Nick completed his military service during Desert Storm, they returned home to the Kansas City area. It is only fitting that Nick has joined the company, continuing the tradition of son-in-laws working for the Nursery. Ben passed away in 1993. He was truly one of the founding fathers of the Horticulture industry in the Kansas City area. ​His wife Virginia passed away in 2000. 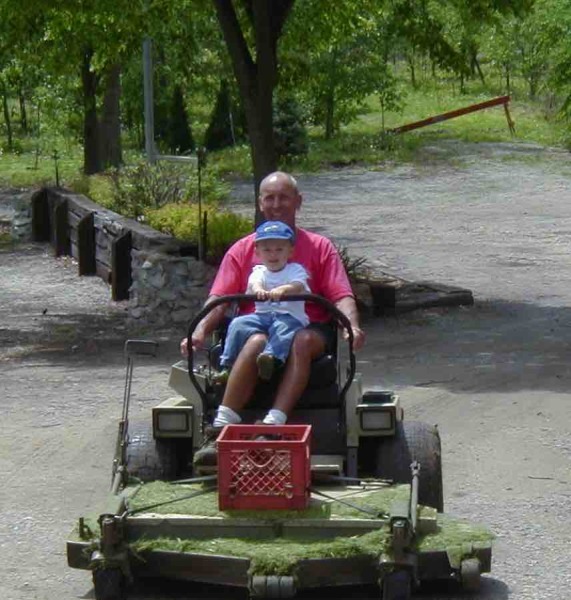 Gary and Cheryl's grandchildren were able to spend lots of time working and playing at the nursery as well. They are the 5th generation of the family to be a part of this amazing business. In 2003, a fire destroyed the original garden center and main greenhouse. Thankfully nobody was injured, but the decision was made not to rebuild. With the growing popularity of the big box stores, the retail garden center business was becoming less and less profitable. The lawn and landscape business continued to operate from the Raytown location, and for several years fresh produce was also grown and sold from a vegetable stand. The stand was very successful and very popular among the local neighbors. In 2016, Gary and Cheryl decided to relocate their business. After being in the family for 71 years, they sold the property in Raytown and moved the business to Oak Grove, Missouri. B.A.R.N. Lawn and Landscape continues to service customers throughout the Kansas City Metropolitan area. Gary continues to operate the business with the same level of quality and professionalism that Ben always demanded.